This chaise is the perfect place to relax. This piece features a long boxed seat cushion and a plush pillow back. Flared arms complete the look and add a touch of contemporary style. This piece comes in several different fabric color and pattern options, so it will match perfectly with your existing decor. For a complete look, add the coordinating sofa and swivel chair. The 1392 Chaise with Flared Arms by McCreary Modern at AHFA in the area. Product availability may vary. Contact us for the most current availability on this product. The 1392 collection provides you with a sofa, chaise, and swivel chair to completely furnish your living room. 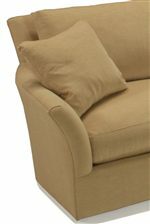 Features include flared arms, boxed seat cushions, and plush pillow back cushions. Customize the pieces by choosing from several different fabric and color options. The 1392 collection is a great option if you are looking for Transitional furniture in the area.